This work was originally intended to form part of a programme in which Hindemith's Piano Concerto and the Chamber Concerto of Alban Berg were to be played. This determined the orchestral forces of my piece, which sum up those of the other two pieces but which also influenced the sound concept of my concerto: thirteen wind instruments and only four strings produce an inequality of weight. I found a solution to this problem in saving the strings for the third movement, where they enter for the first time and replace the wind sound towards the end of the composition. The title original planned, Canticum canticorcum, which I eventually renounced since I am against programmatic explicitness, found a certain reflection in the concerto's musical language (for example, in the soloist's initial cadenza). But there are also quite different influences at work - those of Russion Orthodox church music (in the final chorale of the first and third movements) and German Romanticism (the forest music at the beginning of the third movement which, despite the horn fifths and fluctuations between major and minor, is not a quotation from Schubert or Mahler). And the atonal idiom also leads naturally on occasion to twelve-note themes, but never to twelve-tone rows. the combination of these tonal spheres is not subject to any constructional principle: I merely followed my ear's commands. I have long been preoccupied by the opposition of the tonal and the atonal. In this work I tried to construct a unified system of intonations linking the two soundworlds organically - that is, not only through the contrasting effects of night and day but also by means of the morning and evening transitions and the ever-present play of shadows and colour modulation. Atonality can be reached from any point in tonality (and vice versa). The Violin Concerto's three movements follow the scheme of double contrasts (slow-fast-slow) and are played without a break. The solo part makes no virtuoso demands on the soloist and is predominantly melodically conceived. The first performance took place January 1979 in the Great Hall of the Moscow Conservatory. 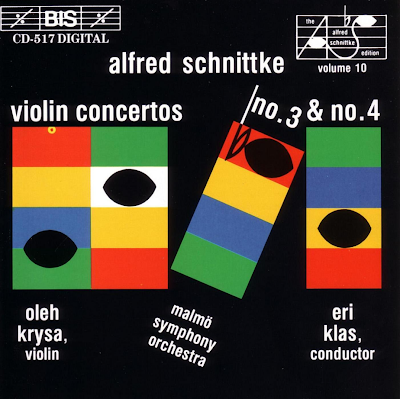 The meeting and co-existence of a variety of forms of musical material, a variety of worlds of style and imagery - these probelms are central in Alfred Schnittke's Third Violin Concerto. The orchestral forces are similar to those used in Alban Berg's Chamber Concerto for violin, piano and thirteen wind players (1925). Additionally there are four string players, whose entry marks the beginning of the finale, of the illumination and alleviation of the general atmosphere. The three movements of Schnittke's concerto are there different stages or aspects of one idea. The first movement, emerging from the soloist's tense trills, presents the 'prehistory', as it were. Here one may discern the most important spheres of imagery in the concerto: firstly the intensively expressive, tauntingly enraged, dissonant structure of intervals which serves as the point of departure for the rebelliously unbalanced second movement; secondly the light and conciliatory major/minor flickering of triad runs, which finally becomes decisive in the finale; and finally the strict chorale, the most important of the elements, which concludes the flow of events like an epitaph. The second and third movements merely develop the 'theses' of the first; they unfold a temporally calculated concept. The strongest contrast arises before the beginning of the finale: a storm-wave of contradictions and passions crashes down in an aleatory culmination; the musical material shatters into the tiniest fragments. And here, amidst the catastrophe, like an illusion of ghostly harmony, horn fifths suddenly appear - in the music of past centuries the frequently-occurring symbol of problems happily resolved. The sound here is devoid of the unambiguity acquired through the centuries; doubt shines through the major/minor play of light and shadow...The tide of music finds no rest; it hurries on into the depths of centuries, eventually finding its hold in a universal, eternal symbol: the chorale. My Fourth Violin Concerto, a commission from the Berlin Festival, is dedicated to my dear friend Gidon Kremer, as a sign of my great admiration and most heartfelt thanks. Gidon has contributed decisively to the spread of my works, both through countless performances and also by inspiring and stimulating other musicians. For this reason the musical material on this four-movement concerto is taken from monograms of Gidon Gremer and of myself - and in the last movement also of three other kindred souls, Edison Denisov, Sofia Gubaidulina and Arvo Part. It is not, however, a constructed Babel (except for the perpetuum mobile passacaglia in the second movement); rather it is an attempt to create a melodic tension both between one note and another and also between notes and rests, with free application of techniques both 'new' and 'old'. Two beautiful plush melodies (the first running through the entire piece as a fatum banale, the second appearing as a false relief in the third movement) are merely two 'corpses decorated with make-up'. On a few occasions (for example the 'cadenza visuale', second movement) a peep is ventured behind the curtain into the soundless, hypnotic music Hereafter - into the world of silent sound (otherwise called 'rest'). But these are only moments, brief attempts to fly; the foundering descent back into the world of sound is inevitable. Or is it? The Fourth Violin Concerto dates from 1984. The concerto is unquestionably one of Schnittke's preferred musical forms. The previous violin concertos had demonstrated quite different compositional methods on Schnittke's part. This piece confirms his path towards greater simplicity, towards love for tonal, extremely straightforward musical figures. A large romantic orchestra is required, reinforced by instruments of striking sonic character such as the saxophone, the felaxatone (usually confined to lighter music) and most especially by an unconventional battery of chord instruments: xylophone, glockenspiel, marimba, vibraphone, bells, celesta, harpsichord and piano. Schnittke employs these last-named instruments principally for the support and coloration of static textures. The idea of a colossal Basso continuo, the chordal accompaniment of baroque music, must have been determining significance in this respect. The Fourth Concerto has four movements. The sequence Andante-Vivo-Adagio-Lento makes it plain that a measured and well audible tone takes precedence over virtuoso passages. Right at the beginning of the first movement, important structural elements are presented. After a reverberating bell motif we hear a peculiarly plain, warm theme in A flat major, its instrumentation rather gentle and peaceful (woodwind and horn). With its tonic/dominant exchange it is intentionally trivial, like an exponent of another, lost musical language. The solo violin tries to attune itself to this, but upon its entry the veil of comfort is torn aside. A dissonant chord, including all twelve notes of the tonal system, is rudely inserted; the violin continues the melodic development with a harsh friction of semitones and broken chords. The mood only brightens when the violin takes up the opening bell motif. The plain theme then occurs once more, this time in C sharp minor, and - richer, as it were, in experience - shot through with distracting notes. The first movement concludes with the return of the bell motif, this time over a dissonant, static string structure. This movement has not only seen the exposition of the musical material but also the erection of the compositional principle: the zones of insecurity lurk behind apparently tranquil beauty. The entire concerto is to be understood in this light. The lively second movement is basically one large cadenza over intricate broken chords from the soloist. At the movement's climax, with ever more rugged breakings, the tone of the soloist becomes more and more 'faded out' - Schnittke calls this a 'cadenza visuale', with the utmost passion but almost devoid of the means to express it. Only after a grandiose entry by the previously silent strings on the note G (the lowest note on the violin) does the soloist regain his tone - but at this point the movement breaks off. The remaining two movements advance other attitudes, stated at their respective outsets, onto a higher plane. In the third, the destabilization of an emphatically beautifully conceived melody is driven forwards; the fourth returns to the serene peace of the bell motif from the beginning of the work.